Sunday November 24 1907 I was busy about the house all morning. After an early dinner I went down home. There were a few friends called. Father does look so nice and restful in the casket. Will came down for supper and we came home at 3.20. Allie [Holson?] came from Grinnell this morning. A fine day. 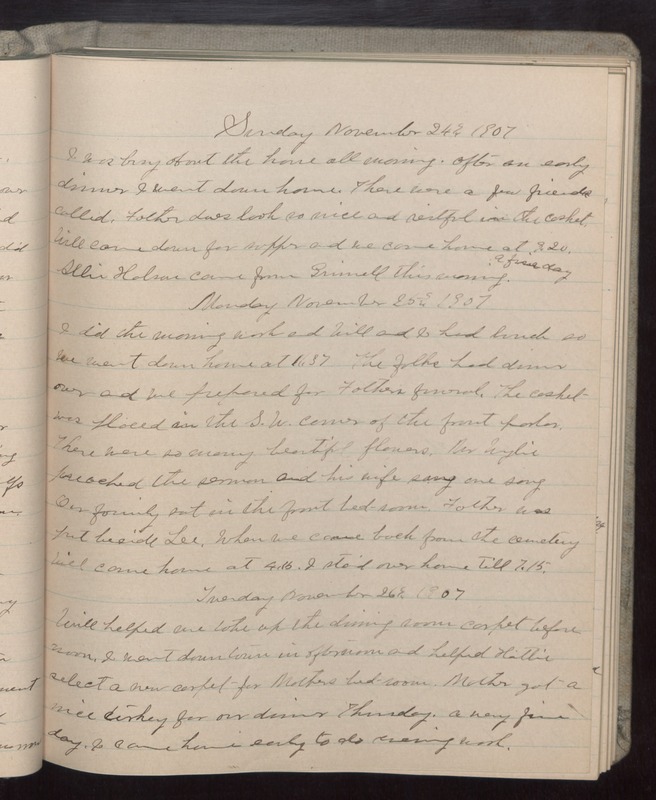 Monday November 25 1907 I did the morning work and Will and I had lunch so we went down home at 11.37. The folks had dinner over and we prepared for Fathers funeral. The casket was placed in the S.W. corner of the front parlor. There were so many beautiful flowers. Mr Wylie preached the sermon and his wife sang one song. Our family sat in the front bed-room. Father was put beside Lee. When we came back from the cemetery Will came home at 4.15. I staid over home till 7.15. Tuesday November 26 1907 Will helped me take up the dining room carpet before noon. I went down town in afternoon and helped Hattie select a new carpet for Mothers bed-room. Mother got a nice turkey for our dinner Thursday. A very fine day. I came home early to do evening work.